Every new parent knows how difficult it can be to get a fussy baby to sleep, but new research suggests that a parent's best efforts may only be exacerbating the problem  and that inadequate sleep in childhood can have long-lasting health effects. "It is very hard to let your child cry it out when they are toddlers," says Dr. Elsie Taveras of Harvard Medical School, referring to parents' tendency to pick up their children or bring them into the family bed to help them sleep. "But if you approach it differently  'I am not even going to start my child making these sleep associations'  it's much easier to prevent [future problems]." That point is central to a new study by Valérie Simard of Hôpital de Sacré-Coeur in Montréal, which examines the link between parents' bedtime behavior and sleep disturbances in children during infancy and early childhood. Simard administered yearly questionnaires to 987 parents, whose children were 5 months old at the start of the study. She found that certain "maladaptive" parental habits  such as the mother staying with the child until he or she fell asleep, or the parent giving a child food or drink upon nighttime awakening  appeared to develop in response to babies' early sleep difficulties, at 5 to 17 months of age. In turn, however, some of those calming strategies, which parents reported continuing to practice at 29 to 41 months, led to disrupted sleep  bad dreams, short sleep time and delays in falling asleep  in children of preschool age. 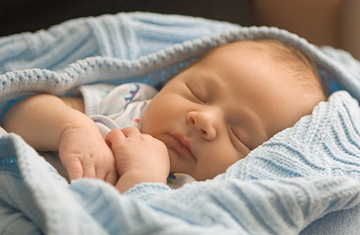 The findings, published in this week's Archives of Pediatrics & Adolescent Medicine, suggest that bedtime behaviors that soothe infants don't always benefit older children. "Giving food or drink to the child may be an appropriate answer when he awakes at night during the first months of life," Simard says, "However, most often, children at 29 to 41 months do not wake up because they are hungry." According to Simard's study, children whose parents fed them when they woke up in the middle of the night at age three were more likely to have nightmares and short sleep times at age four. Babies who grew accustomed to falling asleep with a parent in the room, being held until they fell asleep, or being taken into a parent's bed when they couldn't sleep were also more likely as older children to have trouble falling asleep and to sleep fewer hours during the night. "Co-sleeping with the child does not seem to be a good solution for comforting a child after night awakenings," Simard says. But that doesn't mean that children should be left to wail endlessly, or that parents should never console them. "It might be appropriate to be present in the room, comforting the child for a short time," Simard says. But it's most important "to let the child develop a capacity to comfort himself on his own." The benefits of adequate sleep in infancy and childhood extend far beyond any single night of rest. According to a burgeoning body of research, children who don't sleep enough may be at risk for health problems later in life. Two additional reports, also appearing in the current issue of Archives of Pediatric and Adolescent Medicine, suggest that children's sleeplessness may be associated with an increased risk of being overweight and having emotional and behavioral difficulties in adolescence and adulthood. In one study of 915 children from 6 months to age 3, Harvard's Taveras found that infants who slept fewer than 12 hours per day  including naps  were nearly twice as likely as their peers to be overweight by age 3, potentially laying the foundation for childhood obesity. The risk for obesity was exacerbated by TV watching: 17% of children who slept fewer than 12 hours per night and watched two or more hours of television a day before age 2 were obese by age 3, compared with 9% of the study participants overall. "This is a perfect storm. Not sleeping enough and watching too much TV is a particularly hazardous combination in the toddler years," Taveras says. "There's room for prevention even in the first month of life," she says. In another study of 2,076 children, psychologist Alice Gregory at the University of London followed participants for 14 years, starting when the kids were between 4 and 16 years old. She found that those who slept "less than others"  roughly fewer than 10 hours a night  according to their parents, were more likely than their peers to self-report high levels of anxiety, depression and aggression later, between the ages of 18 and 32. The implication, Gregory suggests, is that children who don't sleep enough may struggle to perform during the day, resulting in lowered self-esteem, along with other emotional consequences. These findings are the latest in a growing field of study dedicated to understanding how sleep affects health, particularly in childhood. Increasingly, research suggests that long-term sleep-related problems may start as early as infancy, and that both pediatricians and parents need to do more to ensure that children develop healthy sleeping habits. "The most important message is that there's a lot we can do to prevent problems from starting  in sleep," says Taveras. "Parents and pediatricians should keep in mind that children have to develop the capacity to regulate their own sleep early in life and self-soothe themselves during the night." To that end, Taveras offers a few simple steps for parents: "Go to sleep at the same time every night. Remove things that will create a lot of stimulation before sleep  don't put a TV in the child's room. These are proven sleep hygiene techniques that will hopefully translate to more hours of sleep."